Wow, what an absolutely incredible experience, words truly cannot describe what it feels like to experience a total solar eclipse. Here's a very early edit of my solar eclipse shots, having never done this kind of imaging before I'm struggling to get the editing correct. I'm sure I'll be posting other edits in the coming days and weeks as I get everything sorted. I'll also put together a timelapse (both from my telescope and from a wide angle lens setup I had running). This is a composite of several exposures taken with my Nikon D7000 and Astrotech AT65EDQ telescope on a Sirius EQ-G mount. The exposures ranged from 1/8000 of a second up to 3 seconds. The sky is orange/brown because of the incredible amount of smoke in the air from the numerous wildfires in the region. 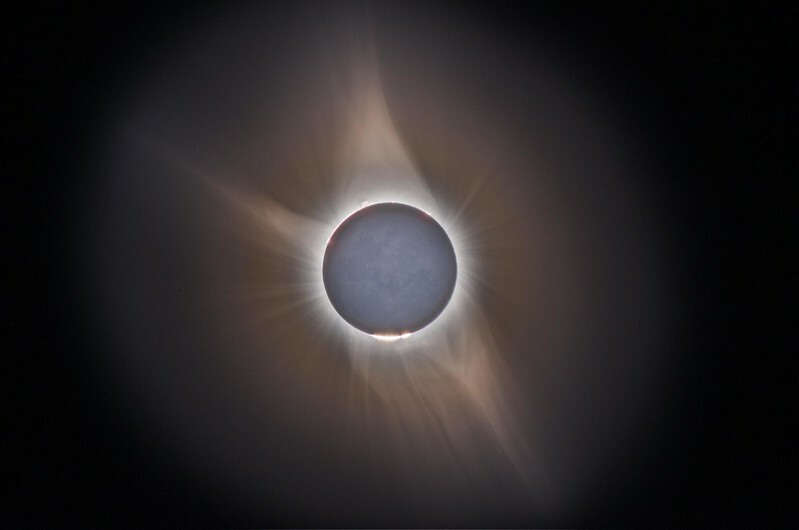 You can also see solar prominences on the upper side of the eclipse, parts of Bailey's Beads on the bottom side, earth shine illuminating the moon, and the incredible Corona extending in all directions.